The pale stone is on the building at first floor level. The black stone is in the pavement in front of the building. However, we have to question whether these two memorials are in the right place. British History On-line talks about The Bell and the Red Lion being where Kilburn Wells was, and these pubs were, and still are, a little further south, now the other side of the railway line. Also this building, as far as we can see, never was a pub. As you can tell from the architecture, it was built as a bank, in the early 1900s we'd say. We've found one very interesting source which seems to confirm our assessment of where the Kilburn Wells were: The Underground Map. 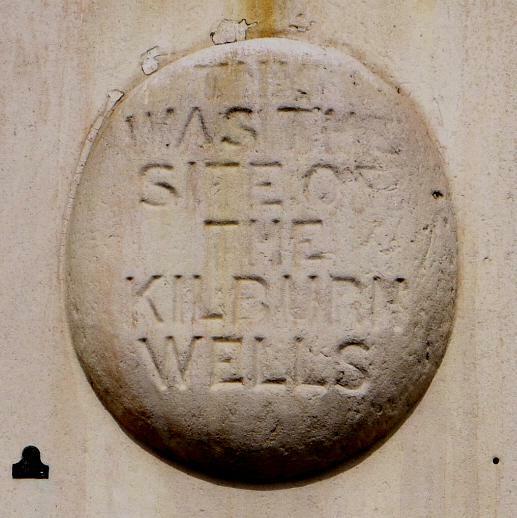 May 2018: Shortly after we posted this item we were contacted by Kilburn and Willesden History, drawing our attention to their page Where was Kilburn Wells? This goes into the history of the Wells and provides some lovely images. From this we understand that the Bell Tavern must have had extensive grounds extending from the extant Bell pub on the High Road northwards to incorporate the spring which was in the northern part of the land behind this bank building. The pub and tea gardens continued successfully but interest in the spring water had already died off when the railway arrived in 1838 cutting the two apart. We thank Kilburn and Willesden History for clarifying this and recommend their excellent site to anyone interested in the history of this area.